Trainer Mick Price believes Grunt (left) will be suited by the spacious Flemington track. Trainer Mick Price is expecting a return to racing at Flemington to benefit Grunt when he runs in the Group One Makybe Diva Stakes. Grunt is the least experienced of the 12 runners in Saturday’s 1600m weight-for-age race, but has an imposing Flemington record. He finished third on debut at the course in May last year while his only two other starts at the track are wins in the C S Hayes Stakes (1400m) in February before the Australian Guineas (1600m) two weeks later. Price gave Grunt a spell after the Guineas to concentrate on the spring. Initially he intended to run Grunt first-up in last month’s P B Lawrence Stakes at Caulfield and then head straight to the Makybe Diva. But because Grunt is a gross four-year-old, Price thought an extra run over 1400m in the Memsie Stakes, in which he finished eighth behind Humidor, would be beneficial. Price is happy with where Grunt is placed and says Saturday is the day he is ready to step up. After riding Vega Magic in the Memsie, Damien Oliver returns to the saddle on Saturday. “Expectations are that he’ll start to improve,” Price said. “We’re going up in distance and getting him on the bigger track which he likes. While not discounting a Cox Plate start, Price is reconsidering plans. 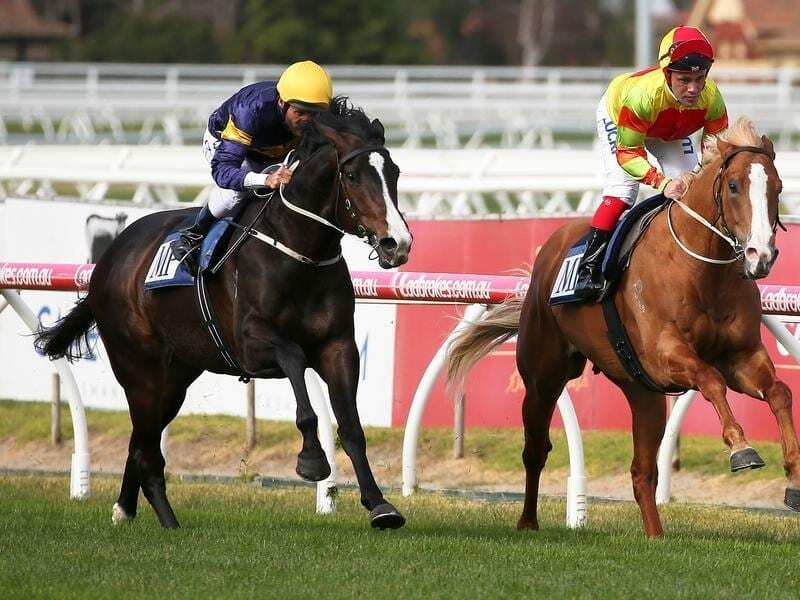 He said the long-striding horse may not be suited around Moonee Valley and while not entirely happy over 1400m at Caulfield he may appreciate a slower tempo at that track over 2400m in the Caulfield Cup. “After his run on Saturday I’ll get a bit of advice from Ollie and work it out,” Price said. “Like a lot of good three-year-olds they come from racing against their own age into racing against harder, older horses which they have to get through. Price sees Grunt ($12) as one of four leading chances in Saturday’s race. He named Kementari, the $3.80 favourite, Humidor ($4) and Kings Will Dream ($4.60) the dangers.